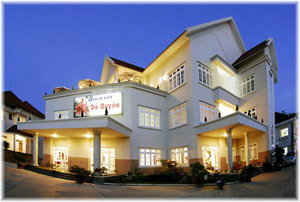 Đo Quyen hotel is a hotel reach standard equivalent to 3 stars, located in the center of DaLat city : Address: 03 Le Thi Hong Gam, ward 1, Dalat City. With architectural elegance , senior facilities, decorate harmony. Campus of hotel is nearly 1400 m2 with a full range of flowers blooming. You will feel the natural flavor of the moment and happy with the quiet space of hotel,your holiday will really relax and meaningful. Annually, we are upgrade and improve our hotels and restaurants, strive constantly towards perfection in service quality and satisfaction of you . Hotel staffs is young and professional training, surely make you happy with the perfectly service, caring customers with all our’s heart. when choosing the service of the hotel, that is you have placed our trust . We look forward to the cooperation and support of you to help our hotel more and more perfectly. - The hotel restaurant serves buffet capacity of approximately 300 guests. - Plentiful menu with european and asia food quality , special attention dishes with the taste of tourists three North - Central - South. - Same time the restaurant have ability meets the needs of hundreds of guests. Staff serving with professional style . Highly skilled chefs , many year of experience. The system table , dinning is mordern funeral, clearning , cool , help you appetite and warm. - Đổ Quyên’s Restaurant commitment to food safety and hygiene . - ADSL system wired and wireless free . -Booking car and booking flights. - Rental bicycles, motorcycles, cars. - Cafe on the terrace. -With the excellent location of our hotel, you can admire Xuan Huong lake Glistening under light as well as the city in night.